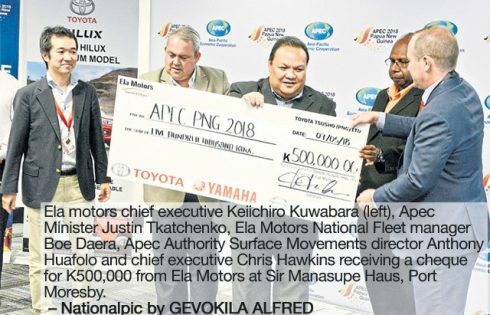 Major motor vehicle dealer Ela Motors has donated K500,000 to the Apec Authority. Company chief executive Keiichiro Kuwabara said they were happy to be part of preparations for the Apec leaders’ summit in November. Kuwabara presented the money to Apec Minister Justin Tkatchenko and Apec Authority CEO Christopher Hawkins. Hawkins said the money would help reduce the costs of acquiring vehicles for the coming second senior officials’ meeting (SOM 2) and the leaders’ meeting. Tkatchenko thanked Ela Motors on behalf of the Government. He said Ela Motors was the first corporate sponsor of the Apec year.